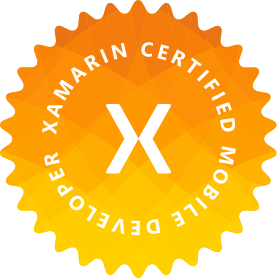 This post is a continuation of building gesture based “easter eggs” into your Xamarin apps (native or Forms). to talk about how we can use these gestures in Debug mode to give ourselves some shortcuts for testing and moving through our application quicker. To breakdown the process setup – we added shake handlers (and keyboard shortcuts for UWP) that can invoke any contextual code in our application. We talked about using this for funny easter eggs, but this functionality can be made into something super useful for us. I call this “Contextual Developer Options”. The idea is take that easter egg handler and use it to display some contextual options that can be controlled page by page or view by view. This can be toggling some UI updates, auto-navigating through the app, testing different scenarios, etc. We’ll use it in our examples. First things first, let’s define our developer options. Now, like I said, our example will be doing this in MVVM and we can use the current page the user is on as the context we want to apply. /// Shows the developer options. This should be called after a native easter egg such as a shake. // call it if we find it. /// Sets up the developer options. /// Adds the developer option. Alright let’s breakdown what’s going on here. Our BasePageViewModel has a List that represents our different options for the given page. Then we have some protected methods we can use in our extended PageViewModels to setup different options. In our SetupDeveloperOptions method, we can setup any option we want for the page, and we put a universal “Go to debug page” example action that is there on every page. So here’s an example of a useful ViewModel that sets up a login page developer option. So what we want on this login page is to be able to shake the device and see the Action Sheet that shows “Use test user” and when selected, it should fill out the fields on the page automatically. Now that our setup is done, let’s wire up accessing these developer options. We need to be able to access our Page’s ViewModel in order to execute the developer options when the shake happens. To do this, we can access the current page via the Xamarin.Forms.Application.Current static accessor. Then use the MainPage property to get around. So now if we are in our LoginPage and our BindingContext is set to our LoginPageViewModel, our shake should reveal the action sheet! We can make our lives a whole lot easier when testing and running through our app by giving ourselves easier and contextual options throughout the entire application. Remember to still write unit and UI tests for your app too! This is meant to be something to make real hands-on testing even easier too. It has saved me hundreds of hours easily. Let me know if you end up implementing something like this too! For now, I don’t have any complete open source project to demo this, but if enough of you want to see a full example and screenshots and different scenarios, I’ll consider putting a full project together. Let me know in the comments or on twitter!